With the passage of the Civil Rights Act in 1964, race relations seemed to be headed in the right direction. However, states acted to circumvent the new federal law, including California that created Proposition 14, which moved to block the fair housing section of the Act. This created anger and a feeling of injustice within the inner cities. On August 11, 1965, Los Angeles's South Central neighborhood of Watts became a scene of the greatest example of racial tension America had seen. A Los Angeles police officer pulled over motorist Marquette Frye [who was with his brother Ronald]; he suspected Marquette of driving drunk. While officers questioned them, a crowd of onlookers had begun to form. When Rena Frye, the boys mother showed up, a struggle ensued which led to the arrest of all 3 members of the Frye family. More officers had arrived on the scene and had hit the brothers with their batons. The crowd had grown and by this point had become angry. 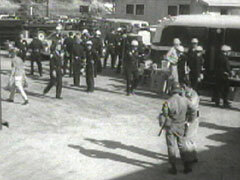 After the police left the scene, the crowd & tension escalated and sparked the riots, which lasted 6 days. More than 34 people died, 1000 wounded, and an estimated $50 - $100 million in property damage. 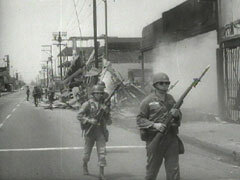 After the Watts Riots, then Governor Pat Brown named John McCone to head a commission to study the riots. The report issued by the Commission concluded that the riots weren't the act of thugs, but rather symptomatic of much deeper problems: the high jobless rate in the inner city, poor housing, and bad schools. Although the problems were clearly pointed out in the report, no great effort was made to address them, or to rebuild what had been destroyed in the riots.